Tune into the latest episode of IN on iTunes and on YouTube for a conversation featuring guests O'neil Lawrence, Dan Brown, Amanda Coulson and Raphael Fonseca. Episode 31 Titled ‘Emerging Art Ecologies’ of IN engages active voices from curatorial, critical and historical positions within the art industry to interrogate the social significance and functions of building art ecosystems in various geographical contexts. We interview professionals about the roles they and their institutions play in their respective art ecologies. 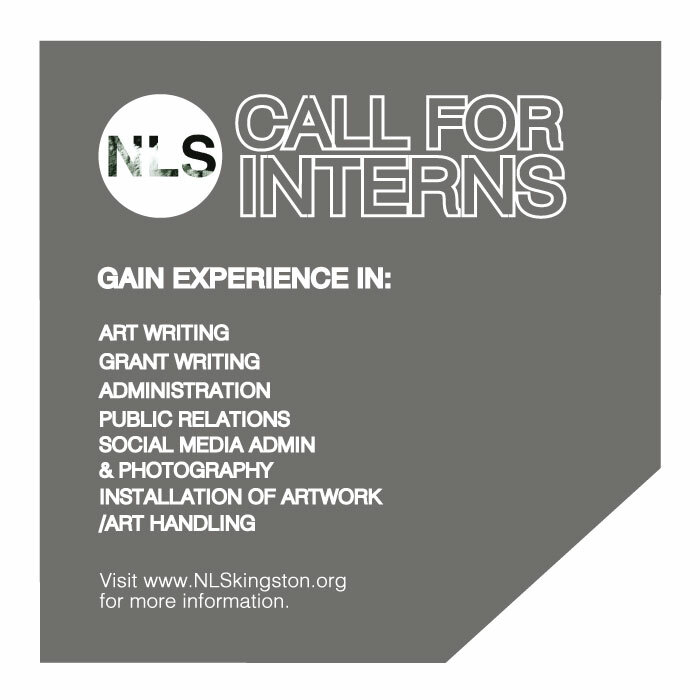 NLS is currently accepting applications for paid internships in art administration. Come see the work in progress of current artist-in-residence Emily Motto. Motto's studio will be open to the public on Saturday, February 16 from 3 to 6 p.m. This event is free and open to the public. Complimentary refreshments will be served. 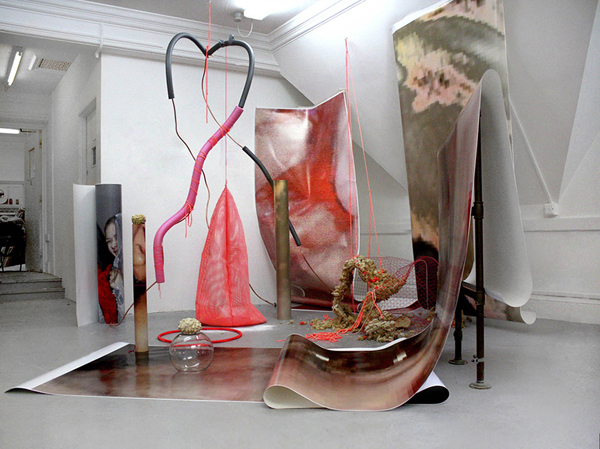 Emily Motto is a London-based artist whose work looks at ways bodies contain and consume space. She received her BFA from The Ruskin School of Drawing and Fine Art, Oxford University and has received numerous awards including most recently The Derek Hill Foundation Scholarship (2017 - 2018) and shortlisted for the Mark Tanner Sculpture Award (2016). Motto has recently completed residencies at The British School at Rome, Rome Italy (2017) and Beaconsfield Contemporary Art, London, UK (2016). Her work has been included in numerous exhibitions in the UK, Italy and Switzerland. Recent exhibitions include a two-person show titled Nexus Space at Platform Southwark and a solo show, POSTURES, RICE + TOYE in London. NLS now has open calls for a 5-month long curatorial intensive as well as the 2019 Fall Residency cycle. Applications for either program are due on February 19, 2019. 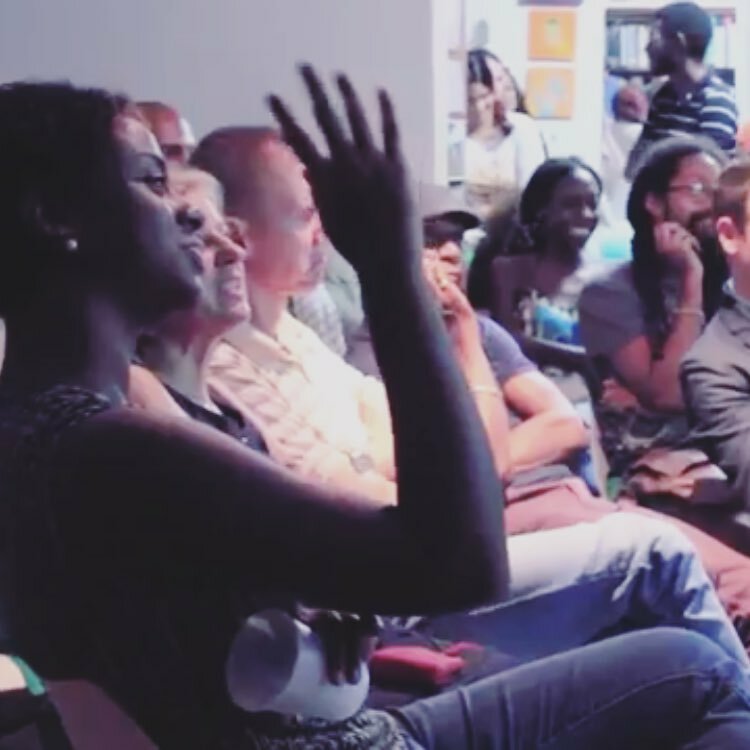 The intensive is a 5-month long mentorship program geared towards addressing the dearth of archival scholarship on the work of artists in Jamaica and the Caribbean by empowering young writers and curators with the tools to write these histories. 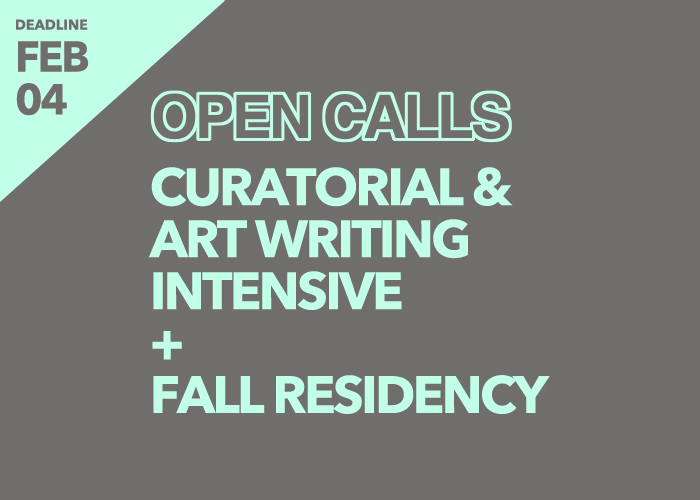 The residency is a six to nine-week program open to visual artists working in any medium or discipline and is geared towards working artists, with developed portfolios, who are intellectually and artistically concerned with pushing boundaries within their disciplines and within the current social landscape, as well as engaging with the public through art. 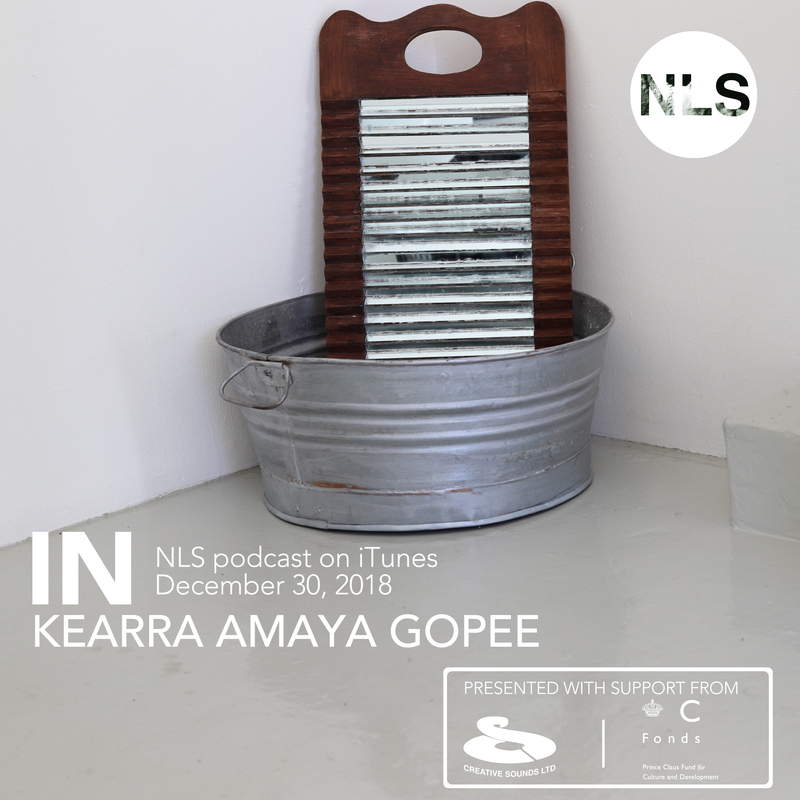 Tune into the latest episode of IN on iTunes and on YouTube for a conversation featuring current NLS artist-in-residence Kearra Amaya Gopee. Gopee gives insight into their process, what inspires them and what they've been working on at NLS during the residency. Join us for Artifact #3: Terra Nullis, a solo exhibition of recent work by Kearra Amaya Gopee and the final event of their residency at NLS. Artifact #3: Terra Nullis is the self-referential final peg of a three-part work that visualizes how personhood, family and intimacy are influenced by lineages of trauma and spirituality within diasporic Caribbean identity. This piece closes the Artifacts series, a trilogy exploring how migration and memory affects manifestations of the Anglophone Caribbean family from the pre-Independence period to the present, using my own family history as a point of reference. Employing scrying and speculative non-fiction to demonstrate agency in crafting models of communication and care within the present, Terra Nullis abandons nostalgic desires for the biological family structure in favour of alternative kinships. 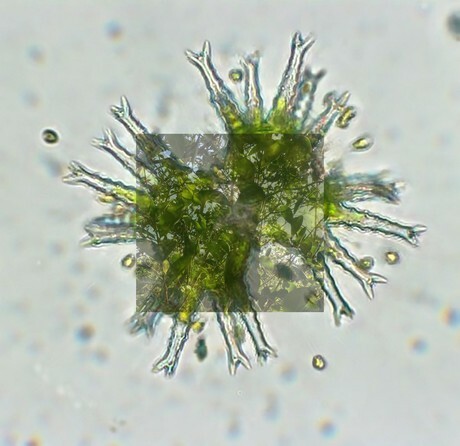 Terra Nullis is “used in international law to describe territory that may be acquired by a state’s occupation of it.” Here, the state refers that of being, one that is constantly being renegotiated with the entry/exit of new modalities with which we engage each other and subsequently reconstruct the self. Join us for a public workshop led by current NLS artist-in-residence Kearra Amaya Gopee. Have you ever wondered how and why on a free platform like Wikipedia, some accomplished and culturally significant individuals don't have pages while others do? Ever wondered why representation of individuals on Wikipedia seems to be disproportionately based in "Western", white canons and within colonial spaces of power? Kearra Amaya Gopee addresses and actively rectifies this in a series of Wikipedia edit-a-thons. 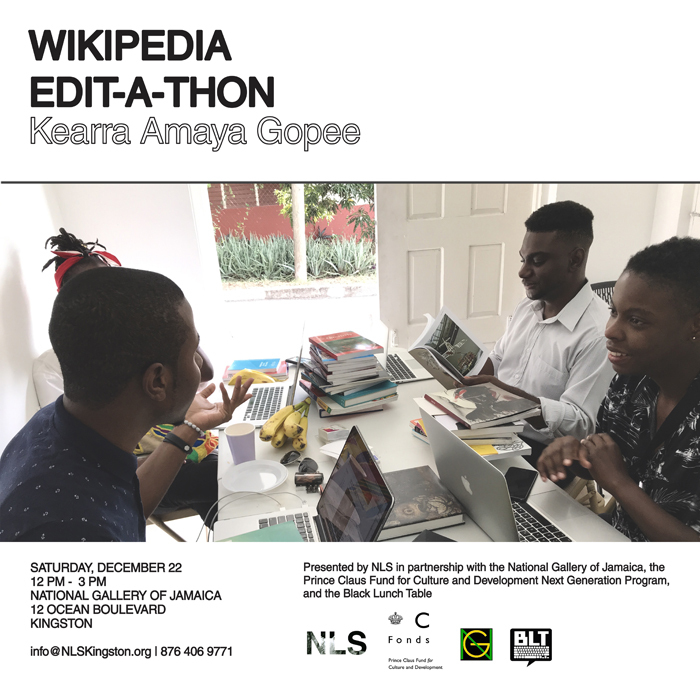 These workshops will teach participants how to create, update, and improve Wikipedia articles pertaining to the lives and works of Jamaican artists, curators and art workers of the African diaspora. Historical documents will be produced that respond to the urgent need for a reconstruction of the art historical record. No specialized knowledge of the subject or Wikipedia editing experience is required; however, participants must come prepared with a laptop. A brief overview of the basics of Wikipedia editing will be given at the start of the edit-a-thon. This event is free and open to the public - with RSVP. Complementary refreshments will be provided. The Edna Manley College of the Visual and Performing Arts in partnership with NLS presents a public talk by guest artist Nari Ward on Wednesday, October 24 from 10:00 a.m. to 11:30 a.m.
Nari Ward (b. 1963, St. Andrew, Jamaica; lives and works in New York) is known for his sculptural installations composed of discarded material found and collected in his neighborhood. He has repurposed objects such as baby strollers, shopping carts, bottles, doors, television sets, cash registers and shoelaces, among other materials. Ward re-contextualizes these found objects in thoughtprovoking juxtapositions that create complex, metaphorical meanings to confront social and political issues surrounding race, poverty, and consumer culture. He intentionally leaves the meaning of his work open, allowing the viewer to provide his or her own interpretation. 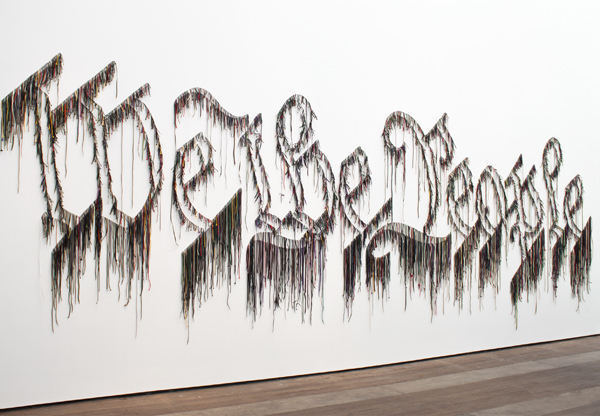 One of his most iconic works, Amazing Grace, was produced as part of his 1993 residency at The Studio Museum in Harlem in response to the AIDS crisis and drug epidemic of the early 1990s. For this large-scale installation, Ward gathered more than 365 discarded baby strollers—commonly used by the homeless population in Harlem to transport their belongings—which he bound with twisted fire hoses in an abandoned fire station in Harlem. Echoing through the space was an audio recording of gospel singer Mahalia Jackson’s Amazing Grace on repeat. The lyrics speak about redemption and change, generating optimism and a sense of hope. As with most of his work, this installation explored themes informed by the materials, community, and location in which he was working. The work has since been recreated at the New Museum Studio 231 space in 2013, and in several locations across Europe. With each change of context, the significance of the work changes as each community differently associates with these found objects. Listen to Episode 29 of the NLS podcast IN now on iTunes featuring guests Alberta Whittle, Anna Arabindan-Kesson, Janice Cheddie, Paul Goodwin, Sumeshwar Sharma and Tiffany Boyle interviewed by Nicole Smythe-Johnson. Episode 29 of IN invites a group of artists, historians and curators to recapture and analyse circumstances preceding and following the Black Arts Movement of Britain's 1980s creative landscape. How did the movement begin and how has the movement evolved to exist in this contemporary moment and what has effected its traces in the present day? The conversation approaches this theme from several angles. What is the relationship of the British Black Arts Movement to transnational relationships defined largely by the conditions of empire? Have spaces outside of the UK, such as the Caribbean, impacted or influenced black consciousness and output in the UK and if so how? What are the ripple effects of the Black Arts Movement in the UK and how have these legacies influenced the development of particular forms of consciousness/influenced the development of particular modes of art making/political movements/ in/amongst/within black and non-black communities in the UK and the Commonwealth? 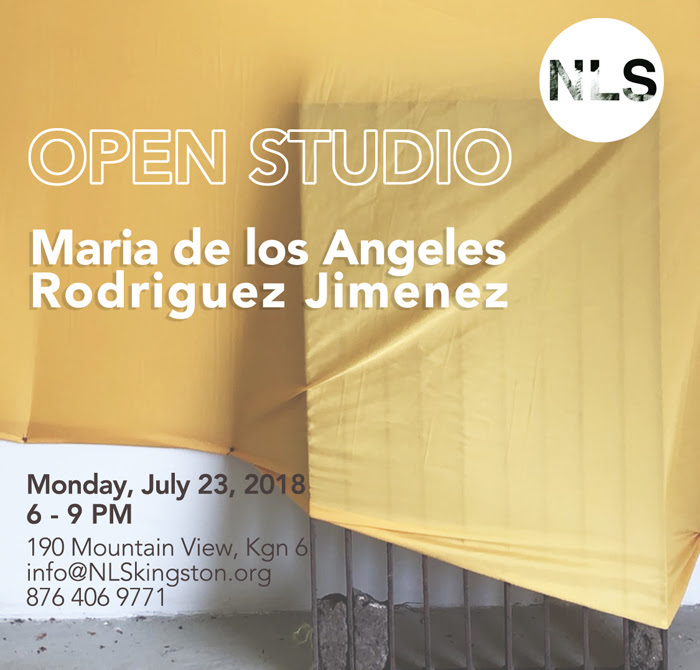 NLS invites you to attend the open studio of current NLS studio artist María de los Angeles Rodriguez Jimenez, Monday, July 23 from 6 - 9 p.m.
María de los Angeles Rodriguez Jimenez' work is about the position of herself, a Cuban born body, in a permanent state of displacement and her relationship to space. According to the artist "I cannot go back to Cuba and be the way I was before, now I am someone else. My paintings try to express the state in which this happens. They are about the inability to belong in any defined structure.” De los Angeles Rodriguez Jimenez has developed an index of color relations to determine specific emotions and memories. The colors can be autonomous or have a new meaning altogether when encountering other colors and the forms they inhabit. María de los Angeles Rodriguez Jimenez was born in Holguín, Cuba in 1992 and immigrated to New Orleans, USA in 2004. 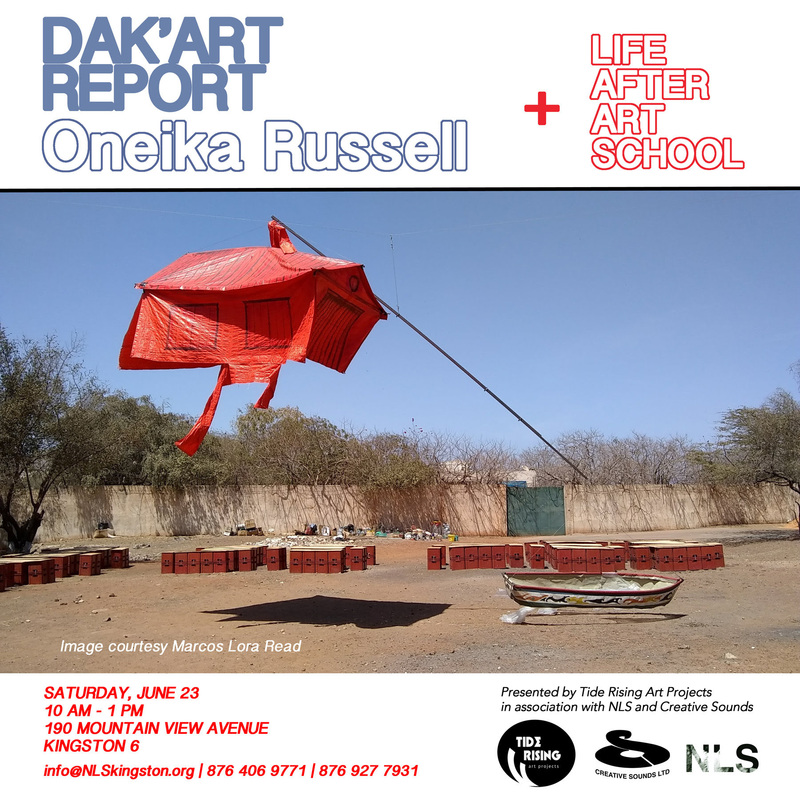 She received a Bachelor’s in Fine Art from the Cooper Union for the Advancement of Science and Art in 2015 and participated in a residency at Skowhegan school of Painting and Sculpture on 2016. De los Angeles Rodriguez Jimenez is currently enrolled in the MFA programme in Painting at Yale University. Life After Art School is a casual presentation and discussion of options and strategies for approaching an art career and art practice as a new artist led by Tide Rising Art Projects. While this event was created to help provide new art graduates go forward in the art field by providing information all interested persons are welcome. We will be discussing topics such as higher education, building a network, portfolio sharing tools, studio practice, representation etc. Please RSVP. NLS invites you to tune into our most recent episode of In, a conversation hosted by Nicole Smythe-Johnson with Jamila Aisha Brown, Maria Magdalena Campos-Pons, Dr. Ariana A. Curtis, Maria Elena Ortiz, Thiago de Paula Souza and Luis Vasquez La Roche. This episode of IN brings together artists and art practitioners of color living within and outside the Caribbean and Latin America to discuss, contribute, and decenter discussions around blackness. Who is black? And what does/might being black mean in different contexts? Certainly, there are examples of how the experience of blackness has inflected creative production in the Caribbean and Latin America, already expanding hegemonic discourses of blackness. What opportunities are there for solidarity across our cultural and national boundaries? These matters seem especially pressing in the aftermath of the assassination of Afro-Latina activist and politician Marielle Franco in Rio de Janeiro. What is to be done? Participants share their relationship to blackness, Afro-Caribbean and Afro-Latin identities, defining these terms, and thinking through what the implications of these identities are for life and work. NLS invites you to tune into our most recent episode of In, a conversation hosted by Nicole Smythe-Johnson with artist collective Cooking Sections, Glasgow-based artist and curator James Hutchinson, and Berlin-based artist Susanne Winterling in the second of two conversations on creative practices focused on decolonisation and nature. This podcast episode is presented in partnership with the British Council with the support of our parent company Creative Sounds Limited. Join us for episode 26 of IN with Ursula Biemann (artist & curator, Zurich, Switzerland), TJ Demos (director, Center for Creative Ecologies, UC Santa Cruz, U.S.A.), Pablo Guardiola (artist & curator, Beta Local, San Juan, Puerto Rico), Deborah Jack (artist, St. Maarten/U.S.A. ), and Marina Reyes Franco (writer & curator, San Juan, Puerto Rico) about new creative practices dealing with decolonisation and nature. 2017 marked a significant tipping point in anthropogenic climate events, the projection of which gained consensus in the scientific community in the late 1980s. Disaster steadily unfolds not just in the seemingly distant arctic but finally greets us here in the Americas. Looking at unprecedented events in the Caribbean alone, during the summer of 2017 two category 5 Hurricanes hit the region in the space of one week destroying fiscally indebted, historically exploited post-colonial nations such as Dominica, Guadeloupe, eradicating the country Barbuda, and bringing current colonies to their knees such as St. Martin (owned by France) and Puerto Rico (owned by the United States). What viable options are there for indivisuals living in the Caribbean have? As the ideological and practical framework of Rights of Nature, a legislative and philosophical commitment which took shape in Bolivia in 2010, slowly gains global attention and adoption through activists, creative practitioners, and academics, we bring together a conversation on the viability and applicability of Rights of Nature to spaces like the Caribbean—which has historically been a locale of imperial rebellion in war and culture. How is our current environmental crisis an economic, political, cultural and ecological one? The conversation will focus on methodologies in individual practices that weave through and connect anthropogenic climate events, colonial/post-colonial economics, environmental activism, gender studies and culture. Blue Curry will be in residency at NLS this month. During his residency Blue will be considering reggae music as regional cliché. One of the Caribbean’s most beloved cultural exports, born out of struggle and inequality, layered with politics and religion, reggae is now employed as a representative music of leisure globally. 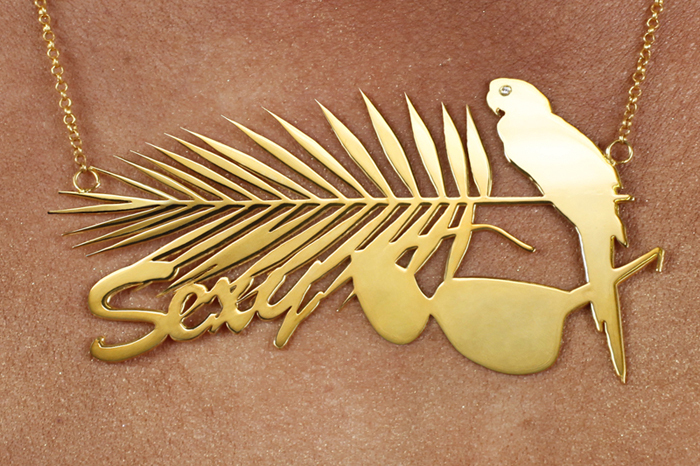 The jaunty reggae beat activates fantasies of sipping poolside cocktails on a carefree island getaway; it entices visitors to the region while reinforcing stereotypes and cultural singularity. Blue will be collaborating with the audio engineers at Creative Sounds recording studio during his three week residency to produce a new work reflecting his investigation into the ways that economic geography influence cultural production and consumption. Taking an experimental approach Blue will bring together his current sculptural concerns with this new audio component for the NLS space. 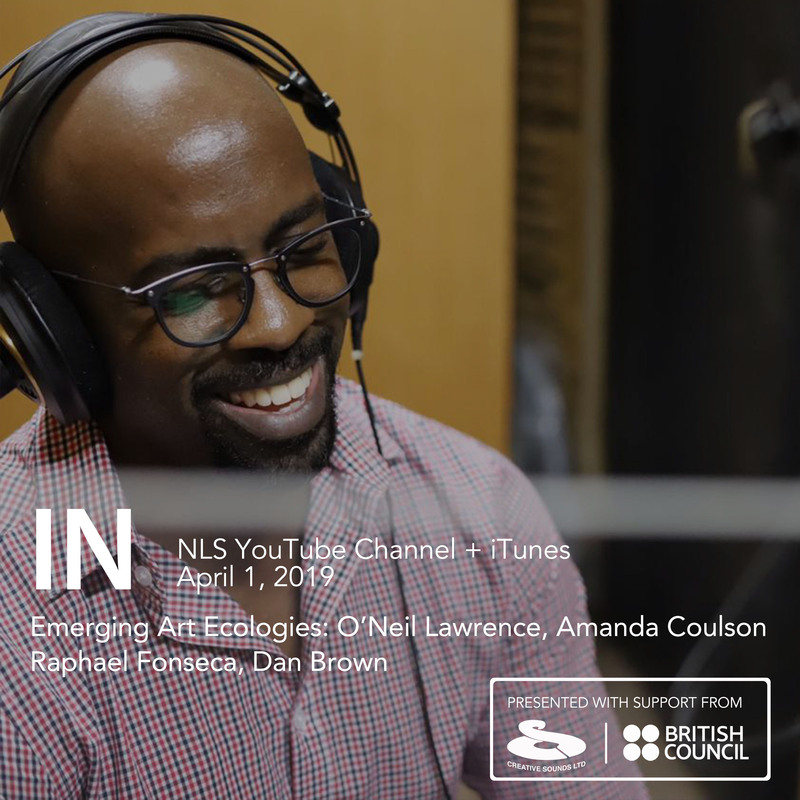 NLS invites you to tune into our most recent episode of In, a conversation with artist Phillip Thomas about his work and opinions on the broader contexts of art and society. In is a series of live conversations with practitioners in the visual arts from Jamaica and across the globe. The podcast is presented with the generous support of our parent company Creative Sounds Limited. Listen on iTunes here. More information on IN here. This Summer Kelley-Ann Lindo will be in residency at NLS expanding her discourse surrounding Barrel Children syndrome. The term Barrel Children refers to minors left behind by one or both parents who have migrated and substitute their presence with the provision of material goods and remittance for the children. The barrels, usually packed with items representing basic food stuff, help families and kin maintain short term nutrition and sustainability. 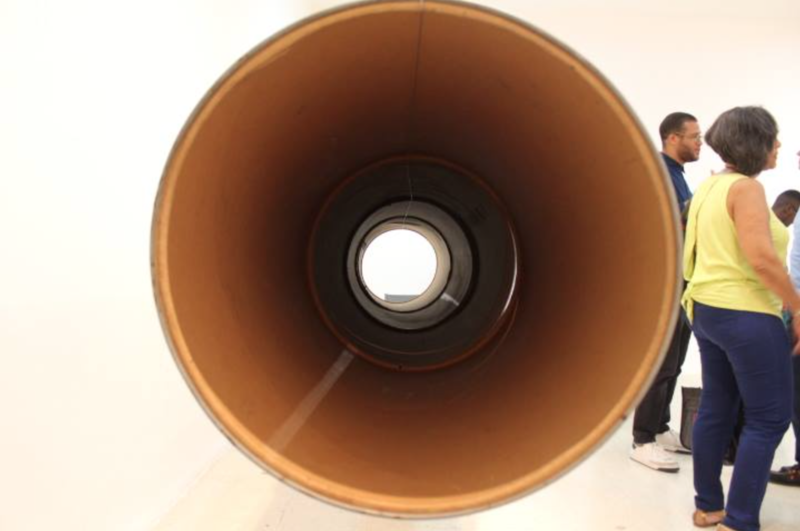 This residency will extend the research Lindo embarked on during her residency at Alice Yard in Trinidad last year; where she focused on the concept of the barrel as a means to communicate. Lindo will further decode the contents sent in barrels and the understandings communicated within them, developing conversation around the formulation of self-identity through childhood experience. An open studio date will be announced. The TAARE programme is made possible in part by support from the British Council. NLS welcomes writer-in-residence Rosanna McLaughlin as our inaugural TAARE Resident. McLaughlin is an art writer whose interests lie in reportage, feminist practices, and the cultural and economic narratives that dictate the type of art that gains prominence. McLaughlin is currently researching into the death of Cuban-born artist Ana Mendieta and the protest movement that followed her death. Listen to the episode of our podcast IN with Rosanna McLaughlin. Tune in to our most recent episode of IN talking with art residencies across the globe. 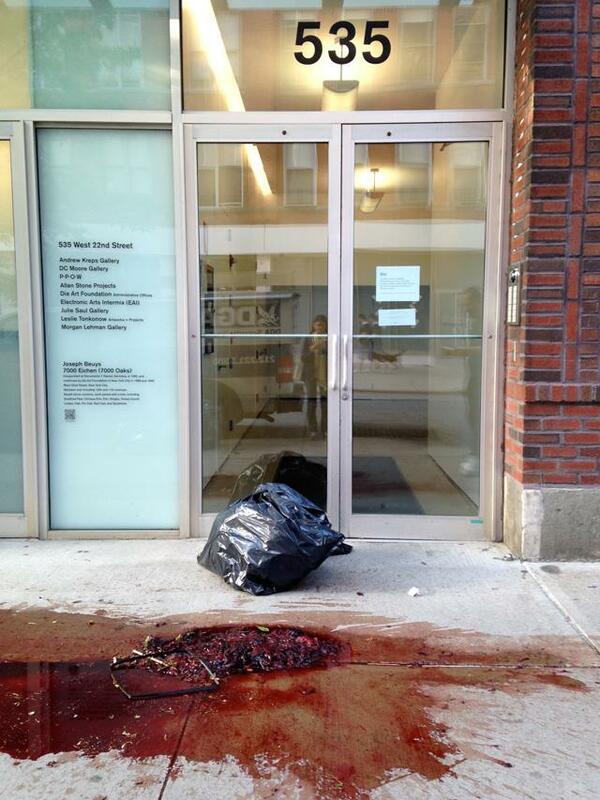 Guests are Bluecoat (Liverpool, England), Residency Unlmited (Brooklyn, New York), Fresh Milk Art Platform (Barbados). 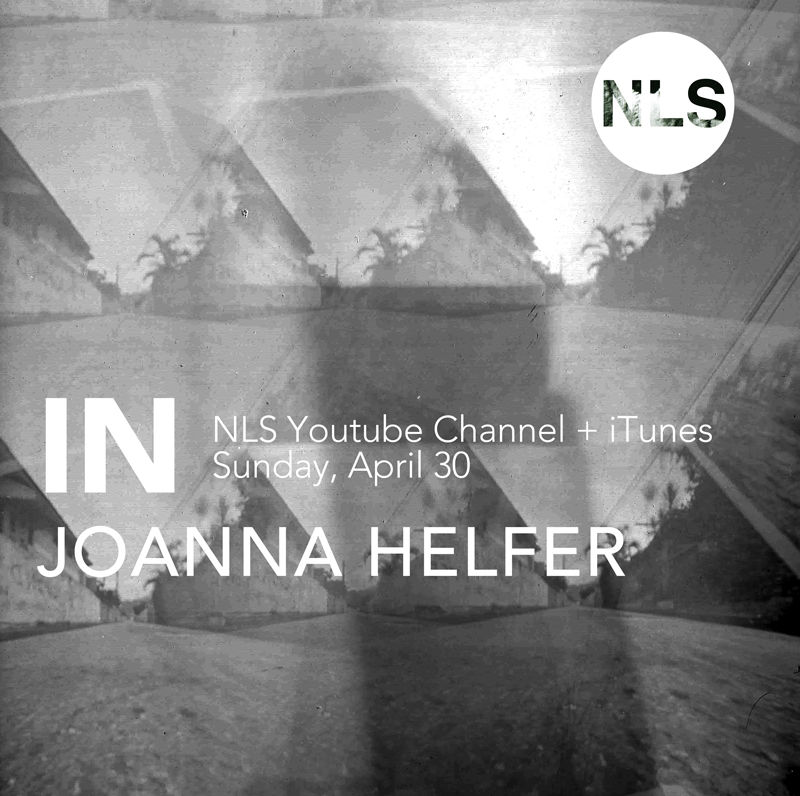 Listen at the NLS YouTube channel. For more information about IN click here. Join us at the Edna Manley College on Wednesday for a public lecture by Trinidadian artist Christopher Cozier. 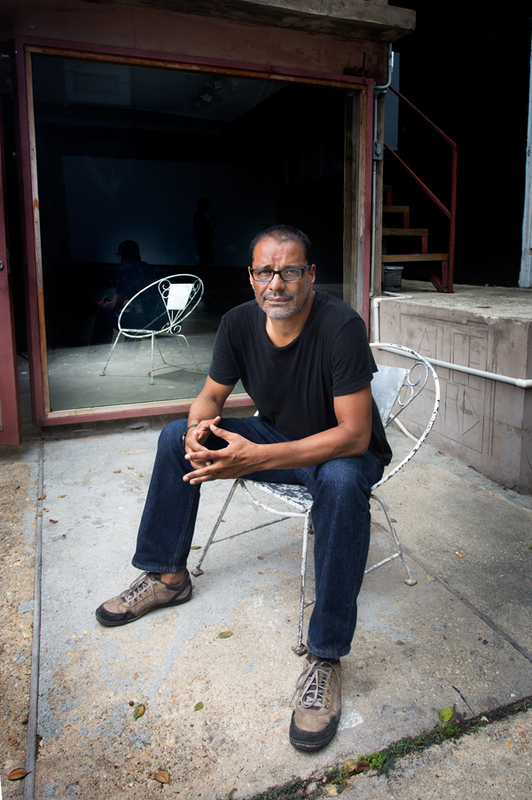 Cozier’s lecture will discuss the potential free/play spaces that Caribbean artists are constantly imagining, constructing, and navigating, including in his own creative practice and at Alice Yard. He will also discuss how the established idea of the Caribbean persists—as a viable fiction, as a site of exchange, an owned product or territory traded between various beneficiaries, internal and external. This event is free and open to the public. Presented by the National Gallery of Jamaica in partnership with the Edna Manley College and NLS. Join us online for the next episode of IN airing on Sunday December 11, on the NLS Youtube Channel bringing together six art practitioners whose work addresses black female subjectivity. NLS is pleased to present a conversation between Autumn Knight, Jessica Bell Brown, Joiri Minaya, Julia Phillips, Lauren Kelley and Oneika Russell. Send in your questions during the live episode to us on Twitter at @NLSKingston or on our YouTube channel. Join us at NLS for the CANYON Shop from December 8 to 11 from 10 a.m, to 10 p.m . CANYON is an eclectic lifestyle brand for those who love life, colour and the magical things of the world. Vintage clothing, fun, active wear and jewelry will be on sale. 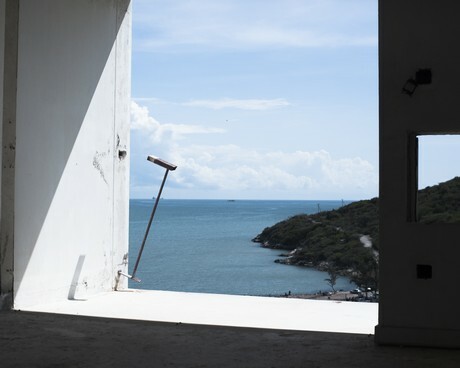 New Local Space partners with The British Council for the Trans Atlantic Artists' Residency Exchange (TAARE) program, which focuses on exchanges between the United Kingdom (UK), Jamaica, and Trinidad and Tobago. 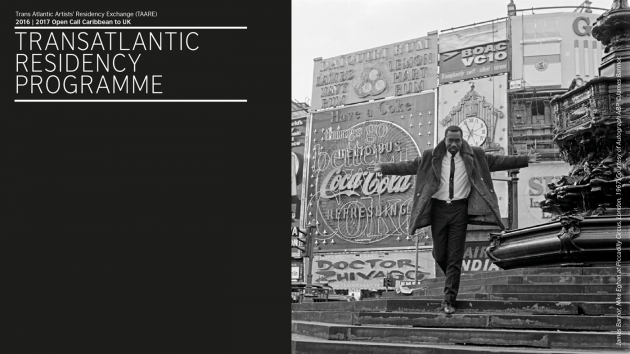 The residency is open to visual artists, art critics and curators in the UK and the Caribbean. The program is targeted at providing research and practice-based residencies while developing trans-Atlantic connections. The submission deadline for applications is December 2, 2016. For full details and information on how to apply click here. Key partners for the project are Alice Yard, Delfina Foundation, Gasworks, Autograph ABP, and Hospitalfield Arts. Join us for the open studio of our current studio artist Demi Walker on Saturday, November 12, from 2 PM - 5 PM. Currently, Walker is working on a project titled City Bikkle at NLS. She is a multi-media artist who produces photographs of ‘natural’ surroundings and unsuspecting subjects, and creates biomorphic pieces using recycled/recyclable materials along with organic forms. 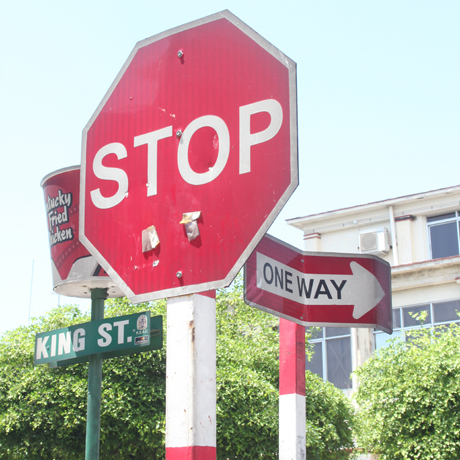 Her present work involves imagery and structures that are symbolic of gastronomical rifts and habits within the cityscape of Kingston. Walker is enrolled in her final year at the University of the West Indies (UWI) – in affiliation with the Edna Manley College of Visual and Performing Arts (EMCVPA) – where she majors in the Visual Arts, and minors in Film Studies. In partnership with the Royal West of England Academy and Bluecoat, NLS is pleased to announce a collaborative residency between Di-Andre C. Davis and Leasho Johnson at Bluecoat, Liverpool. Through their residency the artists seek to open up a space for the recognition of broader narratives around female bodies and sexuality within contemporary Jamaican society. 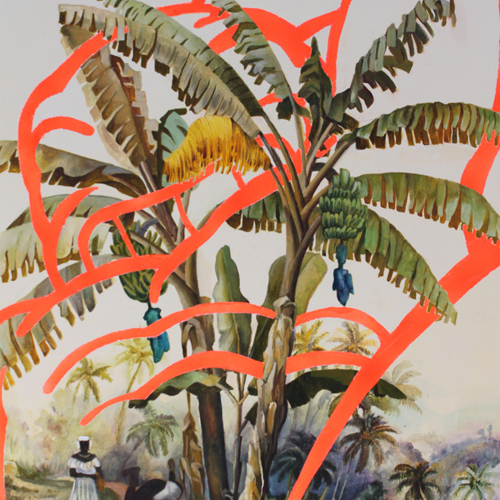 The project (presented in tandem with Jamaican Pulse exhibition at the RWA) aims to encourage conversation and connections between the UK Jamaica Diaspora and Jamaica, raising public awareness of the social / political milieu by creating a cultural exchange and collaboration between artists from Jamaica and the UK. 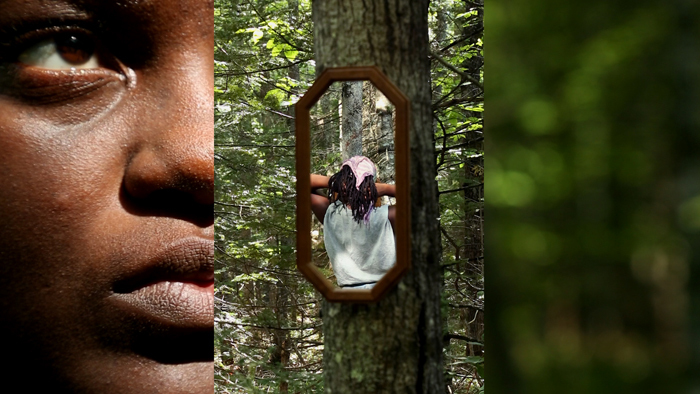 NLS welcomes the 2016 Summer Residents: David Gumbs, Kelley-Ann Lindo and Susanne Winterling, three brilliant artists from Martinique, Jamaica and Germany with diverse art practices. Over the nine-week residency, Gumbs, Lindo and Winterling will bring their unique backgrounds in 3-D mapping, video, painting and marine bioluminescence together to create a responsive mental and social landscape that investigates the vulnerability of water-associated ecologies and their link to our individual and cultural experiences and memories. Aesthetically the artists approach the project with diverse materials, combining amorphous sculptural cues, a lab aesthetic, and a focus on heightening sensibilities and consciousness within audience participation. The artists draw inspiration from Jamaica's marine ecology-- particularly bioluminescent algae and the conch shell, as well as the context of that ecology within human experience of water-- natural disasters, history, practices and politics. Donate to the Summer Residency Kickstarter fundraising campaign here. Berlin- and Oslo-based artist, Susanne Winterling is interviewed by guest host Nicole Smythe-Johnson in the upcoming episode of NLS' podcast IN. They will discuss Winterling's most recent exhibitions including 'Nature after nature' at the historical Fridericianum, Kassel, 'Drift' at the Gallerie Parrotta Contemporary Art, in Stuttgart, and 'The Lulennial: A Slight Gesturay', in Mexico City. Working across a variety of media, including film and photography, Winterling is mostly known for installations that critically intervene in their surroundings through directing attention to the sensual and perceptual qualities of spaces, objects and the representation of realities. She is also one of the founders of the art collective Akademie Isotrop, and is a professor of contemporary art.